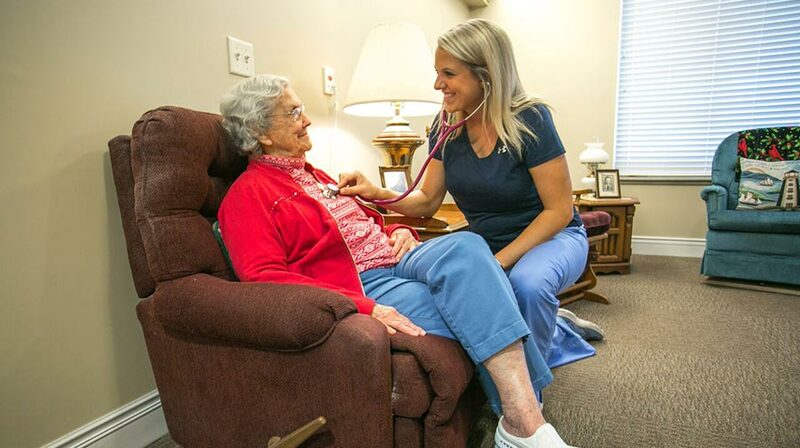 If long-term care is needed for you or a loved one, visit the health care suites we have to offer at Heritage Pointe of Fort Wayne. We would love to give you a tour and introduce you to some of the caring staff that will be serving you. You can also see The Bistro, common areas, and beautiful lobby when you visit. The staff assists with bathing, administering medicine, general grooming, offers a full service salon with maniucures and pedicures, and much more. Remaining true to our philosophy that retirement is All About Living, and living better, we’ve combined a top-notch, professional staff with state-of-the-art facilities and services to provide our residents with the best health care possible. Whether you’re more suited for independent living or require a little more assistance, each of our three communities offer comprehensive healthcare options to ensure we’re meeting the individualized needs of our residents. We would consider it an honor to meet you and give you a personal tour of our health care rooms and facilities. Please call, email or click here to schedule your tour.